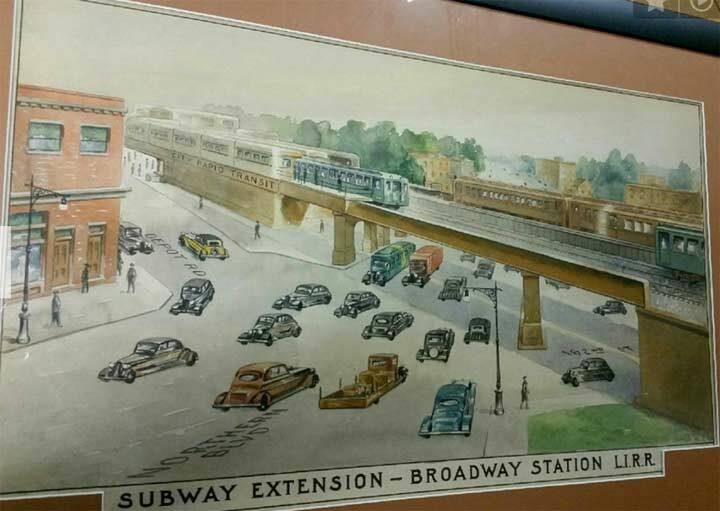 A Forgotten Fan sent me a very interesting watercolor depicting both subway cars and LIRR cars on the elevated Long Island Rail Road trestle at Northern Blvd. and 162nd Street in eastern Flushing, apparently promoting an extension of the Flushing Line on the LIRR tracks. From the looks of the cars, it was produced sometime in the 1930s. The Broadway LIRR station ran at grade until 1913, when the boulevard was lowered and the LIRR trains, which run on an embankment here, placed on a steel trestle. Interestingly there is no “Broadway” here; Queens’ Broadway runs from Astoria to Elmhurst. However, until about 1920, Northern Boulevard was called Jackson Avenue west of the Flushing River; Broadway east of it; and North Hempstead Turnpike once across the city line in Great Neck. The name of the route has continued its fluidity, since it’s now unofficially Northern Boulevard to the Suffolk County Line, but motorists just call it Route 25A once you get out that far. Practically speaking, connecting the #7 to the Port Washington branch would likely necessitate building a connecting track somewhere in the Citifield area, though Governor Andrew Cuomo has already tabbed that general area to set up an AirTrain connection to La Guardia Airport. It’s always been interesting to speculate a connection like this, but both practical and societal factors doom it. More subway lines that never were or can’t be, in Joe Raskin’s The Routes Not Taken. “Comment…as you see fit.” FNY Comments are once again open! I clicked on The Routes Not Taken link. Is the picture on the cover Queensboro Plaza? On the dust cover of the book, end fly leaf: “Jacket illustration: Queensboro Plaza, Queens Borough, January 1913.” Allen, you are correct-a-mundo. The other great “might have been” was the proposal to convert the LIRR ‘s Whiestone Branch to an extension of the Flushing IRT. It branched off from the port Washington line just past Shea and part of its right of way was used for the Whitestone Expressway. Actually it is the Cross Island Parkway that runs along the former ROW of the Whitestone Branch of the LIRR, from the Whitestone Expressway to 154th Street, at which point the railroad tracks ran northward along the current 154th Street terminating near the waterfront at a station called “Whitestone Landing”. Thanks Kevin for your great website. Born in Forest Hills, I grew up in Whitestone, and Nassau County, and it’s been 37 years since my family and I moved to the American Southwest. This website helps me enjoy memories of New York and to see the great changes that have taken place. If you stand at the very eastern end of the LIRR platform at the Mets-Willet’s Point Blvd. station you can spot tracks that go off to the north into the marshes. These are the remains of the Whitestone Branch. You can also see where they passed under the Roosevelt Avenue Bridge. The “bents” of the bridge are at an angle that accommodated the right-of-way. As a kid in the 1950’s, I recall old LIRR passenger cars parked on that trackage just north of the Roosevelt Avenue Bridge, as they awaited demolition. Also the subway car design in the painting looks like a R40 Slant from the front end of the car, the R40 is a B division car (IND, BMT Southern Division) and would not be able to run on the A division (IRT) line. An R40 Slant?! Dude, it looks like an old pre-unification BRT car…..
That is my old neighborhood. While that trestle perhaps could take all those trains I doubt the little houses lining the LIRR tracks near stops like Murray Hill could–train traffic would increase enormously. The beautiful old houses in North Flushing would be torn down and congestion would increase dramatically. So I vote no, thank you. I love the understated style of the art / illustration. This picture almost looks like four tracks are on the viaduct, two each for the LIRR and IRT. Obviously, doing that would require massive civil engineering work which is not likely. Kevin, with regard to your trip to/from Manhattan via Q12 bus and the #7 Line, you may also have the option of the Nassau N20 bus between the City Line (Glenwood St. & Northern Blvd.) and Flushing. It’s the same fare as the Q12 with the same Metrocard transfer at Main Street, but a lot faster because it doesn’t pick up additional riders in Queens after the City Line stop. Running time according to the schedule is about 25 minutes between City Line and Main Street #7 Station. Frequencies are pretty good. Go to http://www.nicebus.com for specific schedule information. That drawing suddenly evokes memories of my life in that area in the ’90’s. On the other side of that intersection was Star Nissan where I leased 2 Maximas & an Altima. In those days it was all about the car so I didn’t pay much attention to customer service or terms. By the turn of the century they alienated me sufficiently so that I changed brand loyalty. Now that I’m older & financially wiser I would never tolerate the treatment I received there. Like Alan, I now live in the Southwest & the competition between brands & retailers here keeps everything more advantageous for the customer. Thanks, capitalism. On the Depot Road side of Northern Blvd there was a vacuum repair & sales store. Hard to believe, but it was once possible to repair an appliance for less than the cost of a new one. Eventually though the owner did sell me a new vacuum which lasted long enough to make the move to AZ with us. Thanks for the memories. I agree with Patrick Sweeney, the artwork is well done and evokes a great spirit of that era it was done in . Judging by the “floating” headlamps on the cars I would say it was done no later then 1937-38. I did an article for a car magazine on the styling progression of headlamp design just a short while ago, so got to research and study that aspect of automotive design. I’m a subscriber & I remember it well. I feel that the main reason so many of those lines were never built wasn’t just because of those who opposed them, but also due to their costs as well, which is why some will always stay proposed at most, not to mention where the money for such lines or extensions will be coming from. This is a wonderful feature that I use regularly. You can fall into 1924 and not come out for hours. (I have many times.) An easy way to navigate it is to start with the 2012 aerial map and enter a current address with which you are familiar. It will place a spot on the map. You then switch to the 1924 map and your spot will be in the exact same place, just back in 1924. That will give you a frame of reference as you wander about. It is especially helpful when viewing parts of Queens, Brooklyn and Staten Island which were open space in 1924. There are amazing finds if you take the time. You can follow along Roosevelt Avenue in Corona and see where the elevated line has been built, where the columns are being installed, and where Roosevelt Avenue is being cut through the open land. You can hover over the Brooklyn Navy Yard and see US Navy ships in dry dock. The possibilities are endless, but you can just have to remember to surface to 2017 from time-to-time. I use it to scout places where my clients are building things to spot problems before they rear their ugly heads.